Last November, we decided it was time to bring some colorful wildlife with a modern bird feeder to the back deck during the cold months, and boy did it deliver. We have had constant winged visitors in all sorts of colors and sizes. The bird cafe feeder has held up very well over the winter, but I would recommend using an adhesive stronger than silicone if you plan on attaching it to a vinyl fence post like we did. A few weeks ago I noticed it was slightly loose while sitting on the post so I knew it was time to take action. This provided an opportunity to wipe down the feeder and give it a fresh look for the new warm season. After removing the feeder from the fence post, I removed the silicone caulking and applied JB Quick Weld that Jeff had in the garage. The JB Weld is much stronger and will hold for much longer. Overall, the bird cafe has been great! We love the fine feathered friends that have visited our modern bird feeder. The only downfall is that there is bird seed remnants all over the deck. After prepping, taping, and applying numerous layers of paint this past weekend, the last thing I really want to talk about is painting, but I feel like I must. Jeff and I are feverishly working to finish our basement before the weather gets too nice that we don’t want to spend any time inside. Luckily it rained this past weekend while we were painting all the trim and doors in our basement. And there was a ton of trim to paint. Check that off the long list of to dos. 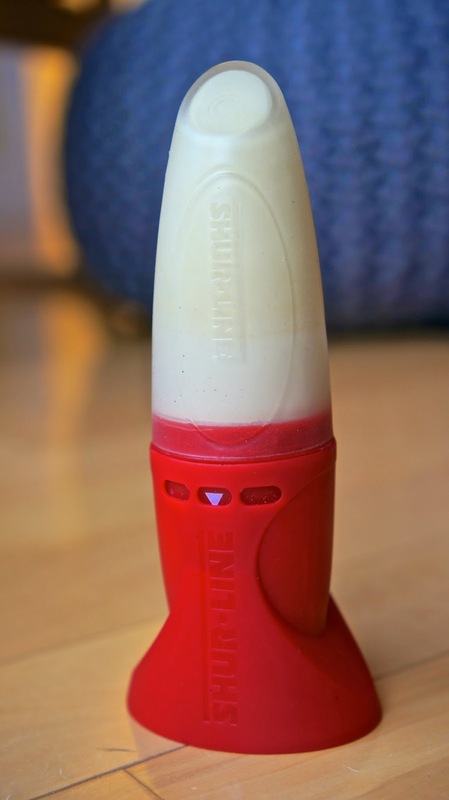 Now, back to the real reason for this post, the Shur-Line touch up painter. Although we didn’t use this handy tool for the large painting job, I did do some touch up painting on our bedroom and master bathroom walls this weekend as well. 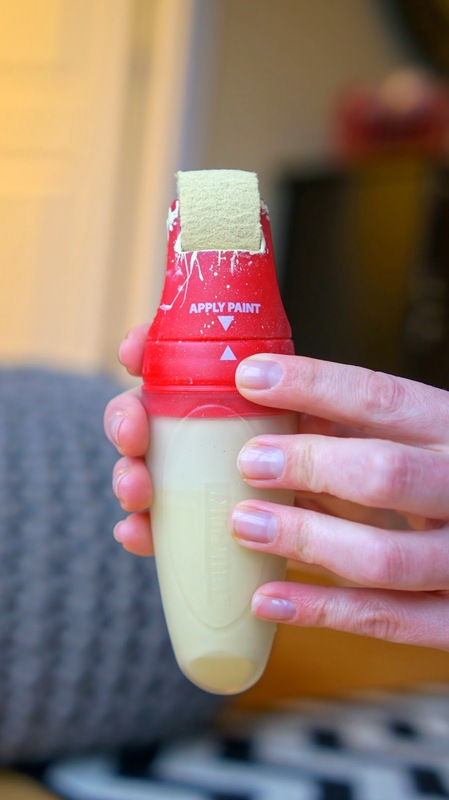 For walls that are easily scuffed and marks, this painting tool is a must. This tool keeps the paint inside and is sealed and locked away for future uses. The roller is made of fabric so when covering up the wall blemishes, you wont see any brush lines. It also comes with a stand for easy storage. Just one hint, when using it again after a period of time, you might want to squeeze it slightly to get it going again. Don’t squeeze to hard or it will go all over the place. You can also buy replacement rollers if needed. I love this tool so much I am getting another one for the white walls around the house and the gray in the basement. 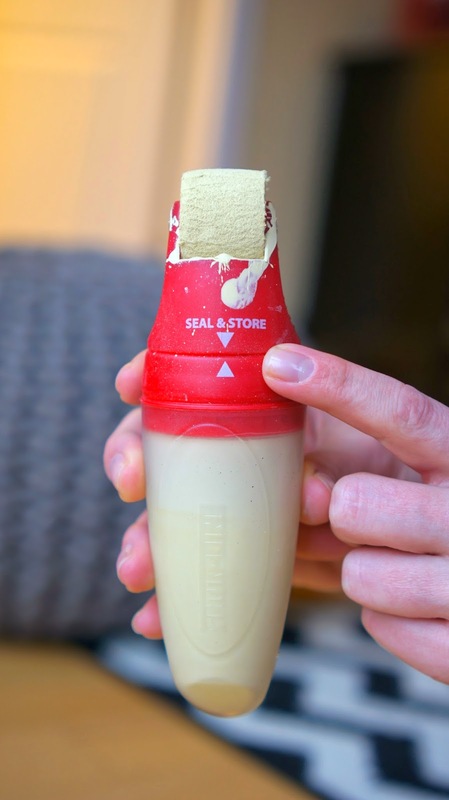 It provides way more than $8 in value for the convenience of being able to pick it up, paint and immediately make things neat without getting out the brushes, etc. The Shur-Line touch up painter looks a little funny just sitting there, doesn't it? This is not a sponsored post, the opinions are all mine, just simply passing on a tool that can make everyone’s busy live just a bit easier. I felt the need to share this quick mint iced tea recipe with you because it makes so much sense and I never thought to do it. I always just thought to brew with fresh mint, until now. I am a huge fan of mint-iced tea, especially the Steaz brand. I haven’t been able to find that specific flavor in my local food store and have been craving the fresh flavor, especially with the weather getting warmer. So when I saw this recipe, I knew it needed to be made immediately. When brewing fresh tea, take a tea bag of regular tea (your choice) and two tea bags of mint herbal tea. Brew them with about 5 cups of hot water then let cool. Try not to steep the tea bags more than 10 minutes or it may bitter. You can sweeten as you prefer, but I love it just as is. Add your sweetener when the tea is warm so the sugar dissolves and disperses evenly. It's seriously easy and can be done in time for you to sit outside in the sun. So good, so easy and just in time for the warmer spring and summer months.